You must make reservations at least 5 minutes in advance of the time at Massimo's Eclectic Fine Dining. Between Tampa & Curlew Rds. Music available on certain holidays/private functions. Private room available for meetings/banquets up 32 people. Main dining room available for larger parties, up to 60 people. Customized menu and on-premise audio/visual equipment rental available. Join Chef Massimo for an artful blend of Italian and Mediterranean cuisines paired with an award winning wine list and full bar. Appetizers range from Hudson Valley Grade-A Foie Gras, Pistachio coated Pan Seared Duck and Brie to Jumbo Lump Crab Cakes and rice flour battered calamari. A rich, creamy lobster bisque is a favorite among customers. Other specialties include Veal Cognac in a creamy truffle sauce, veal chop, sweetbreads, risotto and Chilean Sea Bass. Last, but not least, are the homemade delectable desserts. Complementing his efforts in the kitchen is the gracious, knowledgeable and efficient staff. Tables at the casually elegant restaurant are dressed with crisp table linens, and candles. Cascading fountains decorate the walls. Excellent Food, Excellent service. Have dined here many times and is always top notch. Everyone at Massimo’s made our dining experience enjoyable. The food was delicious, presented beautifully and served graciously. Thanks to all for a memorable evening. Excellent special occasion restaurant. Relaxed ambience. The staff are very attentive and personable. Quality and variety of the “eclectic” cuisine is excellent. Would highly recommend. Wife and I went for our wedding anniversary. Nice, quiet restaurant with only a handful of tables. Knowledgeable staff answered all questions without hesitation. Food was excellent. We ordered the Veal Mossimo and a peppercorn steak special, fantastic food. Homemade creme brûlée was excellent as well. Pricey, but nice for a special occasion. These is our fifth visit to Massimo's the Food and Service is Outstanding!! The quality of food is consistently great and service is very attentive. Total excellent value for the money. This is the best restaurant in the Clearwater/Palm Harbor area. I cannot believe I have never been there before. The food is outstanding. The presentation of the food is marvelous and the taste is even better. We had a party of 7 enjoying a birthday dinner. Everyone thoroughly enjoyed their dishes; Sea Bass, diver scallops, lamb rack, risotto with lobster and crab, veal scallopini and veal parmigiana. All portions were large and we definitely felt we got our monies worth! Our waitress, Michelle was attentive, friendly and we enjoyed having her take care of us. Wine was good, steak was good, slightly overpriced compared to other places, that included a salad even. Dessert was undercooked (apple strudel dish). Place was lovely, just a few minor comments. Our new favorite restaurant!!! When the chef comes out to say hello and check on you, you know you're at the right spot! Celebrating my moms birthday. As always everything from our server, the food and service was outstanding. Would recommend for a special occasion celebrations. Wish they were open on Monday. The quality control and consistency from Food excellence as well as the service is so spectacular. Bertrand is the best and remembers everyone and everything. Make this a must stop ! Doesn’t have to be a special night out , date night will Wow her !! Simply put it’s the best upscale dining option with the Massimo’s family of servers, especially our all-time favorite Bertrand who is the kindest, most thoughtful server we’ve ever been lucky enough to meet, please ask for him, you won’t regret it!!! We like to bring our out of town guests to this restaurant which is consistently excellent. Excellent food and service and ambiance. We could not have chosen a better place to go with friends. Hidden jewel in Tampa Bay. Delectable food, accommodating chef, attentive staff, extensive wine and drink options. Always a pleasure dining at Massimo’s. Excellent service and food. Wonderful dining experience, our server Jenifer was very helpful and accommodating. The food was cooked to perfect. Will recommend to everyone I know. We love this restaurant! The food is the best in the area and the service cannot be beat. Massimo is a fantastic chef! Excellent in everyway!!! We like taking our friends there because we KNOW everything will be 100%!! We chose Massimo's based on the high reviews and recommendations from a parents group to celebrate a special family birthday. We arrived, were warmly welcomed and taken to the private party room which was tastefully decorated and contained an an impressive display of chilled wine bottles. Our server, Michelle was friendly and very accomodating, offering the evenings specials and making helpful recommendations. We started with a great bottle of Pinot and Tuna Tiradito and Calamari appetizers. The Tuna Tiradito was absolutely delicious and the Calamari was tender with a tasty dipping sauce. The hot crusty bread and roasted red pepper butter was a great compliment to the appetizers. We dined on Lobster Ravioli, Eggplant Parm, fresh grilled Grouper, Gemelli and a "melt in your mouth" Filet Mignon. Everyone loved their meals and there wasn't a bit left on anyones plates. We were also very pleased as Massimo's was able to provide a child's plate of pasta for my 4 year old granddaughter. She loved the pasta and red sauce. We were pleased with the entire experience and will definitely return. 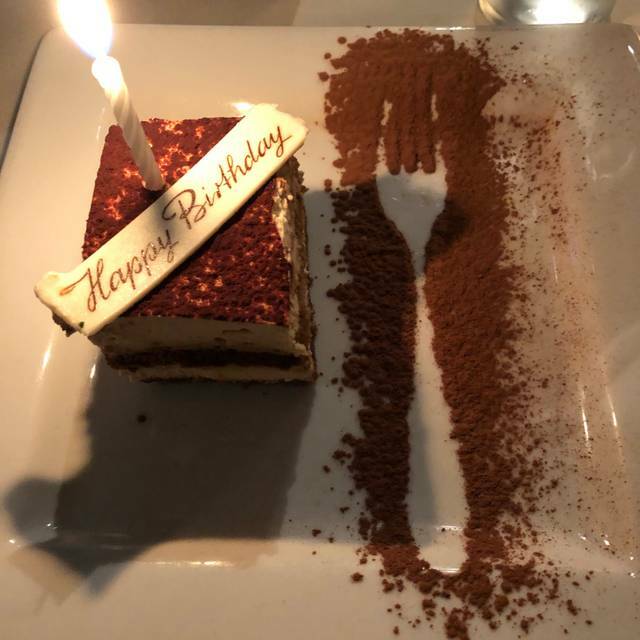 It was my sons (39) birthday and he chose Massimo’s. To celebrate my wife and I invited our other son, wife and 4 year old to dine with us. Just an excuse to be with family. I love veal parmigiana and my other son loves chicken parmigiana and happened to see that bot are only in the lunch menu, so called to see why. I called the restaurant was told that, because each meal is prepared that day, they like “special” requests to be called in a day in advance. Okay...new guy...are you serious? I go to XYZ and ZYX and I can always get both !!! I said thank you, I’ll go to YXZ and get my parmesans...serious ?? A minute later, my Phone rings...gee...Massimo’s is calling. Serious...they could have just said “okay”, but loose 5 adults & a child $$$ ? Miraculously, guess what? The owner, chef can make the parmigiana dish for us. Cancel the other reservations, because...my son (for his B’Day) requester this restaurant, and my wife told me to give it a try. Here we are, all sitting at a table, enjoying family and awaiting (a never been there) dinner. Now, here we go..our server promptly introduces him self and dies all the typical “waiter” stuff ((Like XYZ restaurant) and tells us specials and (our Parmigiana) dishes. We started with bread & butter, because my 4 year old grandchild likes it and wasn’t bashful. Out comes the most delicious herbal butter (and plain) with warm (apparently) fresh lightly crunchy baked bread...gone in 45 seconds!!! We were then told that LOBSTER bisque was the soup of the evening!?!? WHAT? Here’s a guy from Boston and...what is the soup?! Now, the rest of the meal didn’t plateau, or get less delicious, but was a journey of pure pleasure. Bottom line..this is the BEST Italian restaurant in the Tampa Bay Area, hands down and the gentleman that served us, is the most detail oriented person I have ever had the pleasure of being served!!! I am ABSOLUTELY sold as was every one in our family! Thoroughly enjoyed our meals and our waiter B. Focused too much on presentation. Small portions and mediocre food. The server was top notch. We had a wonderful experience. Michelle was our server and she was fantastic. The food was excellent and served with enough time between courses to enjoy it. There was no rushing us. It was a great anniversary dinner. Perfection as always with Massimo and his lovely wife and our all-time favorite waiter Bertraund who always makes us feel welcome and special. Can't wait until our next visit! Scott and Dawn H.
Fabulous food, never a disappointment. wait staff is friendly and eager to please. Massimo is a wonderful Chef. Very disappointed in food. Seafood risotto was poor. Lamb mediocre. Ceasar salad not special. Restaurant came highly recommended. Very expensive. Would not return nor recommend to friends. Always a favorite! Michelle is the bomb! The food is amazing. Service was excellent. My husband had penne ala vodka which is always excellent. I choose the salmon in a curry sauce. I must say I did not love the curry sauce other than that it was very good. 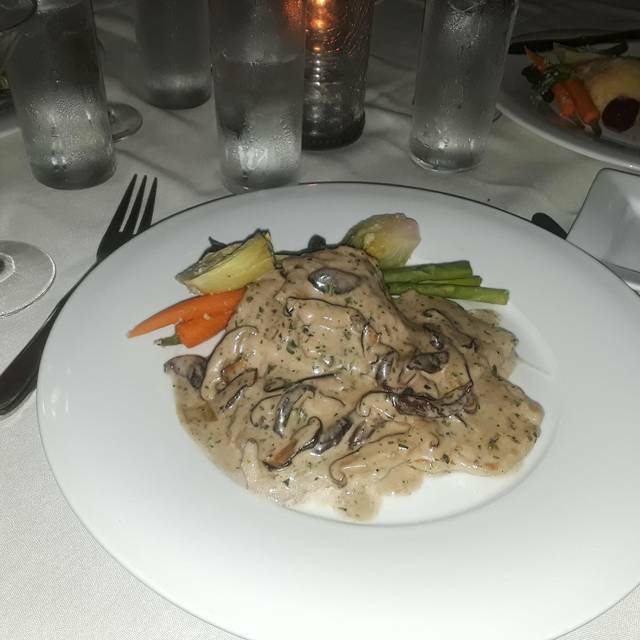 It is always a pleasure to dine at Massimo's and also to discuss the experience with Massimo himself. Bertrand, the waiter, was very courteous and knowledgeable about the contents of the dishes and the style of preparation, as he was about the wines. Great food and service, a notch better than most restaurants in the area. One of my favorites. Massimo’s has been one of our favorite restaurants for years. The food was exceptional (as it always is) and our waitress—Michelle—was excellent. We had a fairly large group of seven and everyone loved their food and had a great time. We will be back again soon. This restaurant is a neighborhood gem!! 50th Wedding Anniversary and it was the best restaurant in Florida we have eaten in since moving here 7 years ago! !